BEAUTIFUL. MODERN. BOHEME. Modern Condo just off Commercial drive! 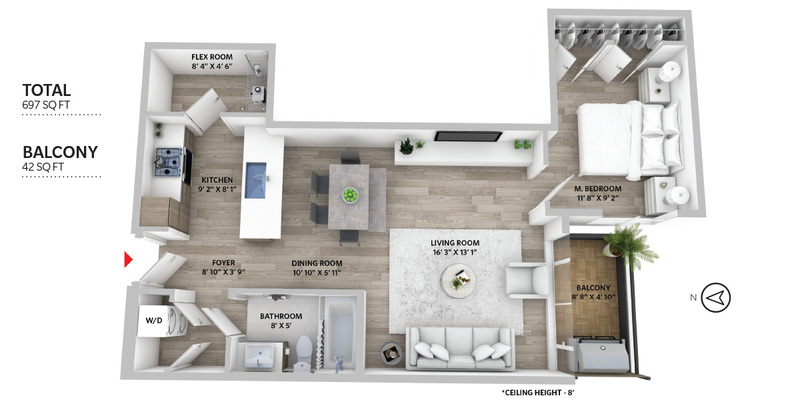 This spacious one-bedroom corner unit at The Boheme features an open concept floor plan, 8'2 ceilings, wide plank laminate flooring and quality finishes throughout. The dreamy kitchen is equipped with gas range, quartz countertops, stainless steel appliances, and built-in microwave, and a private deck - perfect for year-round grilling! This quiet condo also has flex space (great extra storage/pantry), soaker bath, and bedroom with built-in closets. The Boheme is just blocks from some of the best cafes and breweries in town, with a Yolks & Starbucks right downstairs! The building also features a gym, rec room, rooftop deck, and more. Parking, en-suite laundry, pet friendly and rentals complete the package!